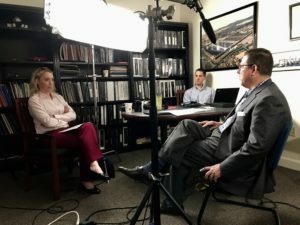 Skillman Video Group did a shoot on Wednesday, August 15th, for a medical malpractice insurance company called Coverys. 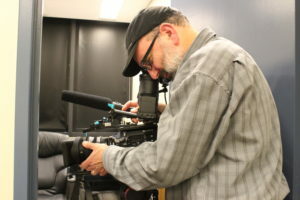 Coverys is a consistent client of Skillman Video Group, and continues to be a client through the years. We filmed a talk for them during a live conference. And now, I am here to tell you all about what happened during the shoot, and what I learned from it. 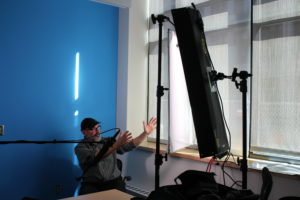 Lighting during live event shooting for Boston video production can be tricky. During the shoot for Coverys, the lighting was not very good. The lights on the ceiling for the room were not very powerful, but the light coming in from the half-covered windows was ridiculously bright. This resulted in some very interesting shadows on the speaker’s face whenever she would walk to the left side of the stage. However, we were able to adjust the camera settings so that the actual footage was not that bad. 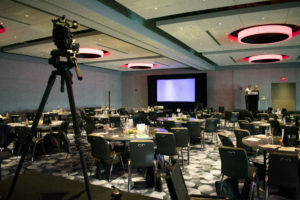 So if you plan on shooting a live event, be aware of the lighting in the room. It could make or break your video. When filming a live event, sound is kind of a problem. You can’t use your own sound feed from your camera, because it would be picking up the entire room sound and everyone watching the speaker, as well as the actual speaker. Basically, the sound would be messy and awful. 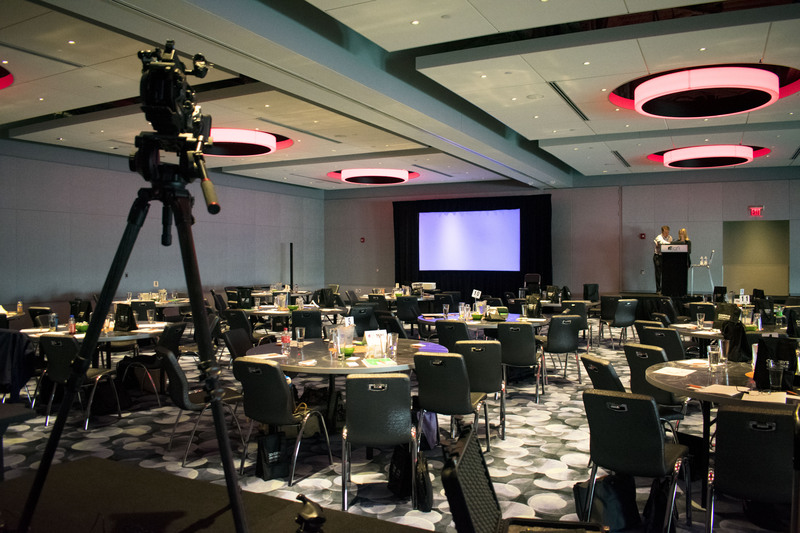 For video production Boston, it’s important to make sure the venue of the event can provide the sound feed for you. That way you can hook up the microphone on the speaker to your camera, which is what we did, and the sound will be a lot better. Funnily enough, the location of the actual camera during a shoot for a live event is more complicated than one might think. Because guess what. The shoot comes second to the live event that is going on. Which means that you can’t just put your camera in front of the stage and block everyone’s view, even if it means you’ll get a better shot. And you can’t film from the audience, because the angle that the speaker would be being filmed at in video production companies Boston would be absolutely awful. So we put our camera on a riser platform at the very back of the stage. That way nobody is being blocked by the camera, and the camera can get a lovely eye-level shot of the speaker. I recommend that if you are filming a live event, you make sure your camera is on a riser platform as well. I learned a lot from participating in a live event shoot, and I hope you learned something as well! Skillman Video Group LLC specializes in Video Production Boston Call us anytime at 1-800-784-0140. This entry was posted in Boston video production services and tagged audio, best boston video production companies, boston video company, Boston video marketing company, boston video production, boston video production company, Boston videographer, corporate video production on August 20, 2018 by Bridget Wixted. Recently, I filmed a YouTube video that I had written for my internship with Skillman Video Group. And building up to the shoot day, I wasn’t really sure what to expect. I made sure I was prepared, and I made sure my actors were prepared as well. 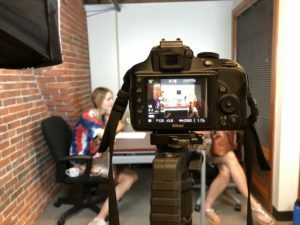 However, I still didn’t learn what was really going to happen until it did, so here I am to teach you a few things you should expect on a shoot day for Boston video production. Now, if you’re filming a YouTube video, odds are you don’t have professional actors. I definitely didn’t. However, the actors I did manage to convince to be in my video did an excellent job regardless. But because they were not professional actors for video production Boston, none of them were completely confident in their lines. They all knew their lines, but they were still nervous about performing them once the camera started rolling. What I needed to do was make sure they were as comfortable as possible, and once they were, they did an amazing job. So don’t get frustrated with your actors for not doing something a certain way. Most people don’t perform well under pressure, so try to instead be encouraging and patient, and odds are the shoot will go smoothly. I am going to be completely honest. I don’t have a ton of experience with sound in video. I usually just don’t film many videos with sound in it at all. I’m more of a put music in the background and silence the video type of person. However, for this shoot, since I wrote in several lines, sound was a huge priority. I was lucky enough to be able to borrow a camera that I could record the sound on separately. My camera does not have decent sound recording, so this was extremely helpful. I would recommend doing this for anyone who doesn’t have access to an external microphone or camera with better sound recording. 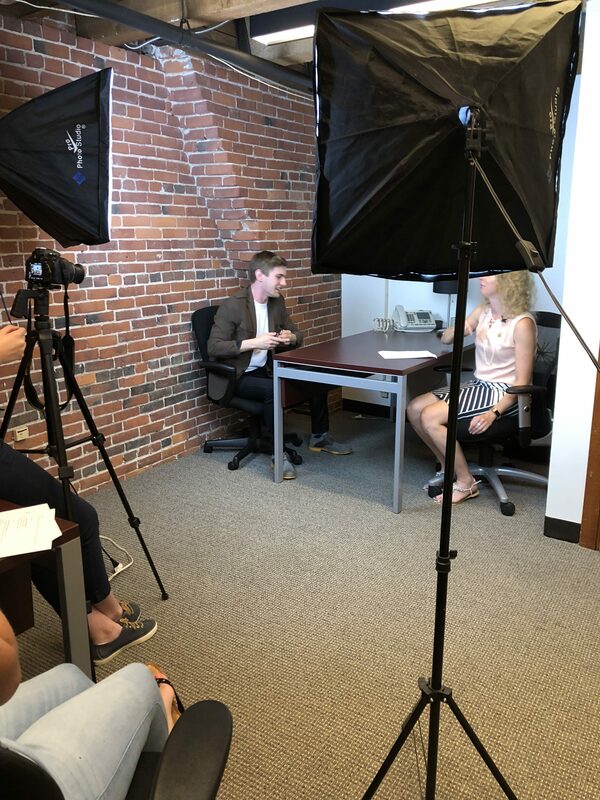 Shooting a YouTube video for video production companies Boston can be stressful, but in the end it’s worth it. If you know what to expect, you stay organized, and you make little to no mistakes, you will end up with a product you are proud of, and that is all that really matters. This entry was posted in YouTube Videos and tagged boston video company, boston video production, boston video production company, Boston videographer, corporate video production, Video Marketing, video production services, YouTube on August 16, 2018 by Bridget Wixted. 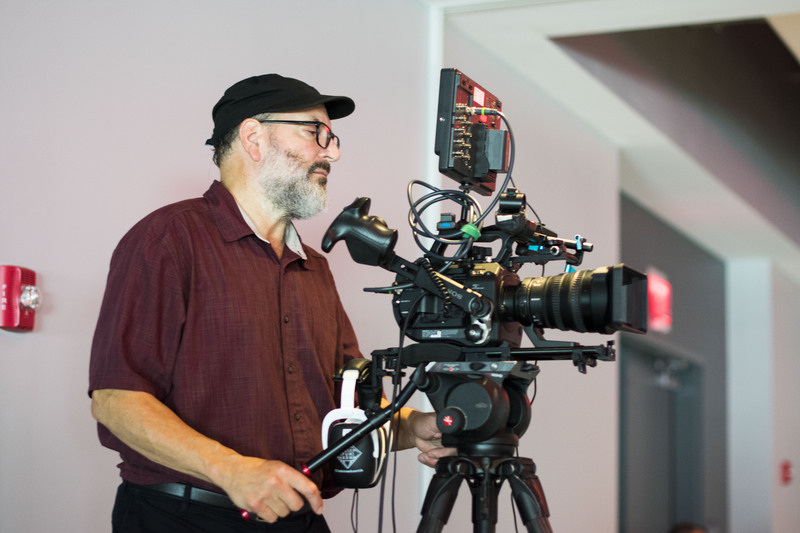 Are you planning a video production Boston shoot? Do you want to know all about how to find and/or use equipment for the shoot? Well lucky for you, I am here to provide that information! When creating a video project, you will definitely need a video camera. There is absolutely no question on this matter. Now, if you are doing this project for school, it is probably fine to use a smartphone. However, I would not recommend that method, as smartphones fill up storage quickly and the video quality is not as good as it would be on a regular camera. While preparing for my video shoot for Skillman Video Group: a Boston video production, I decided on using my Nikon D3400, even though the sound quality is terrible. The video is perfectly decent, and I was going to use an external microphone anyways. Making sure you have good light quality in your video is important. You don’t want your video to look like you took it in a dark cave in the middle of the night, so make sure your lighting is decent. Using natural light can be tricky in video, because of the sun changing and clouds. Overall, the sun is very fickle sometimes. You could be filming and then all of a sudden have to stop because the sun went behind a cloud. Or maybe you started filming when the sun was behind a cloud, but now the sun is shining in everyone’s faces and creating a glare on the camera. You can make natural light work, but artificial lights are always helpful. A couple soft box lights here and there would be a good idea if you’re planning to film indoors especially. Unless you have a professional video camera, like production companies Boston do, you might want to think about the sound quality on whatever camera you’re planning on using. Investing in an external microphone could be important if you’re going to be filming with a beginning camera like myself. This is especially important if you’re planning to film outside. With background noises whipping everywhere, having a microphone that can focus on the sounds you need in your video will be vital in ensuring that your video turn out good. Preparing your equipment for a video shoot may be stressful, but as long as you think of everything you possibly could have and you stay organized, you’re all set! This entry was posted in Video Production and tagged audio, audio equipment, boston video company, Boston video marketing company, boston video production, New England video production company, Post Production, video production services on August 2, 2018 by Bridget Wixted. Part of the work of a summer intern at Skillman Video Group is to create a video for YouTube that you write, direct, and edit all by yourself. Now, this can seem pretty simple, considering it’s j ust a five or six minute YouTube video depending on whatever topic you choose. But no, this is just simply not the case. If you’re interested in making a YouTube video, you should choose whether or not you want it to be funny or serious. Personally, I chose to make a funny video. You could also decide to make something serious, there’s absolutely nothing wrong with that. Lots of amazing videos and short films are serious, but I personally would rather make something fun. Something that makes everyone laugh…hopefully. You also need a concept: a topic for your video. I decided to make my video an SVG-themed parody of a popular reality tv show called “The Bachelorette”. I picked this because most people know what it is, and it’s extremely easy to make fun of. Sometimes important sacrifices have to be made when it comes to Boston video production humor. Next, if you want your video to be the least bit successful, you will need to write a script for it. This is the hard part. You have to make sure your story makes sense whilst creating characters, jokes, and ironing out all the details. You need to be thinking about locations you can use, people who can play your characters, and what is funny and what isn’t. Writing the script for my marketing video took a while because I had to figure out which contestants could be funny yet sensible options for my parody show. However, since the show already exists, I basically just followed the layout of a typical Bachelorette episode, which made my job a little easier. Coming up with a concept for a video is easier said than done. However, once you come up with one, turning that into a script is a lot more complicated. We didn’t even discuss what shooting and editing one is like! But once you have all of your details ironed out, you will have created something you’ll be proud of for a long time. Forever, actually, since once something is on the internet it never really goes away. This entry was posted in YouTube Videos and tagged best boston video production companies, boston video company, boston video production, boston video production company, boston video production services, Boston videographer, Video Production, YouTube, YouTube marketing on July 30, 2018 by Bridget Wixted. A green screen is exactly what it sounds like: a screen that is green. And it’s purpose is to just sit there and be green. Because in post, it can be edited into an amazing background. If you recorded yourself singing in front of a green screen, an editor could change it to be you singing on the moon, standing in a field of cows, on set for a Boston video production company, or even on a big stage in front of hundreds of people! You could look like a famous singer without actually having to sing in front of anyone at all. Below, I will provide three extremely interesting and compelling facts about the wonders of green screens. Fun Fact #1: Green screens take forever to set up. Since the purpose of a green screen is to have another background overlayed on top of it in post, it needs to be wrinkle free. Otherwise if you are trying to look like you are on the moon, you will instead be on a very wrinkly “moon” that looks a lot like a cloth and not very much like the moon. At all. After you set up the stands for the cloth to hang off of, it requires about two hours of tightening the cloth and stretching it out in different places, and then steaming or ironing the fabric so that it looks pristine and beautiful. With zero wrinkles. Fun Fact #2: Green screens can be made out of different materials. Typically, there are only really two different materials that a green screen can be made out of: cloth and paper. Paper green screens are better for stationary sets that don’t need to be moved around a lot and have already been built on a sound stage. 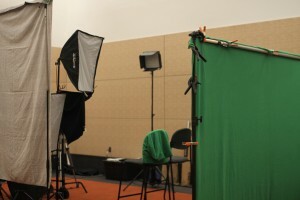 Cloth green screens are better for on-location Boston video production shoots where it might need to be moved. This way there is less of a threat that the screen will rip or tear, and there are usually less wrinkles. Fun Fact #3: Green screens hate natural light. Because green screens need to be used as a solid background, there can’t be any light coming in from behind it or next to it. Then, and I’m continuing to use the on-the-moon example, your lovely on-the-moon space background will be see through. And you won’t look like you are on the moon anymore, you’ll look as though you did a bad job lighting your green screen. Always getting rid of natural light when shooting Boston video production green screen is necessary. As you can see, green screens are pretty darn cool. If you ever shoot with one, don’t forget to remember these fun facts so your shoot will be as successful as possible. This entry was posted in Uncategorized on July 18, 2018 by Bridget Wixted. When working on a video shoot, it is important to know ahead of time everything you can do to be as helpful and productive as possible to make sure the shoot goes by seamlessly for everyone. Don’t be that person who doesn’t have everything they need. All you will be doing is making everyone else unhappy, and who wants to work on a video set where everyone is stressed and anxious? Bring water, SD cards, gaffers tape; bring whatever you need and make sure you don’t forget it. Nobody wants to be working with someone who has a sour attitude all day. It lowers the energy on set, and all in all makes it unpleasant to work with you. Plus, you may not get hired again if nobody wants to be around you the one day you did get to work. Not to mention, if some things aren’t going as planned, you will stress the client out if your attitude is anything less than positive. Working all day can be tiring, especially if you’re stuck inside shooting with no opportunities to relax. This is why it is important to bring food and water with you. Bring healthy snacks to keep up your energy levels; aka a banana or some mixed nuts. Avoid foods like candy or chips, because they will give you a quick rush of energy and then you will go back to being exhausted. Don’t let that call from your grandma disrupt the entire video production shoot. By keeping your phone on silent, you are making sure that nothing happens to interrupt the shoot, which is only a good thing. Also, having your phone start ringing makes you look unprofessional, and nobody wants that. Try to have fun! Enjoying working on set might be a bit tough considering you could be working a ten hour shift, but having a positive attitude can rub off on the people around you. If everyone is in a good mood, having fun on set and enjoying your job will be easy. Working on set can be stressful, but it can also be really fun. Don’t forget that! 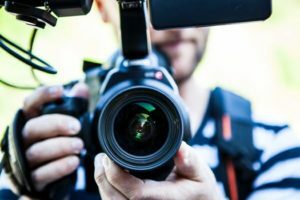 This entry was posted in Uncategorized and tagged boston video production company, New England video production company, tips on set, Top five tips on set, top video production services, video production tips on July 16, 2018 by Bridget Wixted. Working on a film set can be exciting, exhausting, and hectic all at the same time. There are so many things to set up, to fix. So many people you need to ask about what goes where and who needs to be here or there. However, having what you need to make the video production shoot go by as smoothly as possible is a huge bonus. What Should I Being to a Video Shoot? 1.First rule: bring lots of water. It is easy to get dehydrated by standing around all day handling the hot lights and the heavy equipment. Bring a refillable water bottle so you can keep the environment safe and stay as hydrated as possible throughout your long day of shooting. 2. Make sure you have a phone charger. It is likely you will barely be using your phone at all, but just in case you forgot to charge it the night before and need it for directions on your way home, it is always better to be safe than sorry. However, don’t forget to turn your ringer off. Don’t be that person on set who’s phone goes off in the middle of a take. 3. Bring extras. Of everything. Whether it be SD cards, gaffers tape, or lens caps, bring more than one. Sometimes things get lost, and it may not even be your fault. So don’t forget to bring more than one of everything, just in case. It can only help, and odds are you won’t even need them. 4. Take a backpack with you. Backpacks can be extremely helpful during a shoot, and not just because that’s where you can store all of your belongings. You might need to transport the equipment to another area, and having a backpack with you could be a huge benefit to the crew. When working on a video shoot, it is important to always come prepared. It makes you seem professional, which is always a good thing. The last thing you should always have with you is a good attitude. It sounds cheesy, but everyone around you silently thanks you for it. 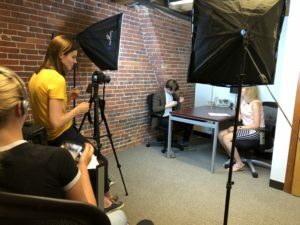 This entry was posted in Boston video production services and tagged boston video production company, New England video production, tips on set, video production tips, what to bring on a video shoot on July 15, 2018 by Bridget Wixted. Call Skillman Video Group today!